Baotou was our first orphanage visit after all our kids were required to return to their home provinces. Baotou has a great relationship with Shepherd’s Field and has sent their therapists to us for training in the past. During our first visit, we were excited to see that their therapy ayis were doing skilled work with the children. Our time there was spent individualizing the treatment plans for the kids in therapy and also working with the caregiver ayis to train them on safe feeding techniques, stretching for children with cerebral palsy, and developmental play. Our team observed there is a need for more in-depth training on autism and sensory needs, and they planned to address these issues during their next visit. The six children still at Baotou—Aaron, Dustin, Jenna, Sid, Naomi, and Cathy are all doing well. Thomas was initially returned to Baotou but is now home in the US with his Forever Family! During our first visit, we delivered Naomi’s wheelchair as it could not be sent with the children in the summer, and we brought her a soft comfort toy as well. Her caregiver was receptive to our recommendation of feeding her in her wheelchair to prevent aspiration. We observed that Cathy enjoys going on walks with her caregiver and was happy to receive a toy piano provided by one of her sponsors. Aaron and Dustin both enjoy frequenting Baotou’s sensory gym and each of them received weighted blankets and sensory toys we had brought with us. Sid was excited to receive familiar activities he did while in school at SFCV. He lives with other boys who also have autism, and his caregivers said he is a very helpful young man. We noted that Jenna has formed a strong, healthy attachment with her caregivers and is attending school. We recently did a quick return visit to Baotou and during the two days we were there, we focused on observing the needs of the orphanage for future in-depth training periods (such as therapy conferences). 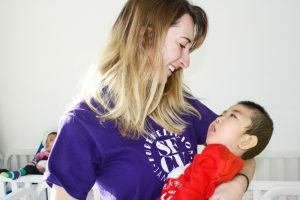 We were able to provide less-intensive trainings on sensory needs and autism, as well as feeding and positioning for children with cerebral palsy. The therapists at Baotou sought our advice on three children they were struggling to provide therapy to and we were more than happy to help! As on our first trip, it was again noted that our SFCV kids are doing very well. Sid has started attending a special needs classroom and is quite excited about it. Jenna was in Beijing for a medical appointment, so we did not get to see her during this trip.